Obtained from organic ingredients and advertised as being able not only to avert night sweating and hot flashes, Warmi Better Menopause Relief is a natural supplement aimed at increasing the quality of life for women. Among its benefits, the manufacturer lists mood improvement, reduced vaginal dryness, better heart health and many others. The product is also aimed at those suffering from allergies, since it does not contain soy. Here is some more information on this particular product for women. 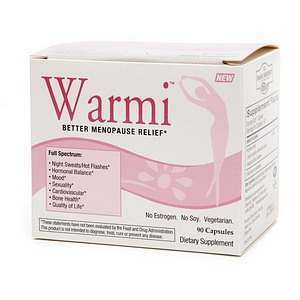 What Does Warmi Better Menopause Relief Contain? The above ingredients are good for women’s health, especially when aging. They promote better heart health, they reduce inflammation and are also good for regulating metabolism. However, the fact that there are no herbal extracts included may put off some customers. Traditional remedies play a major role in promoting better health and fewer menopause symptoms and they should not be neglected. You need to take three pills daily, each for every important meal of the day, and you can expect solid results within 30 days. 90 capsules of Warmi Better Menopause Relief, the necessary for one month, cost 29.95USD. The manufacturer offers refunds on returns sent within 90 days from the date of purchase, but only for unopened and undamaged items. Warmi Better Menopause Relief is based on a particular formula, focusing on a few phytonutrients that may play a major role in sustaining female health later in life. However, it does not look like this recipe is made specifically for addressing menopause issues, so it may not be as effective in treating such symptoms, when compared to similar products. Jackie Horowitz	reviewed Warmi	on June 6th	 and gave it a rating of 2.